The most important thing is to bring a healthy person back to society!…”. Adaptogens – pharmacotherapy agents used in preventive medicine. These are harmless non-toxic agents with antistress, stimulating, tonic and anabolic properties. When used properly, they stimulate functions of interconnected systems of the body: CNS – hypophysis-adrenal system, thyroid and reproductive glands – immune system – tissue metabolism, and improve the following: increase CNS vigilance, improve endocrine regulation, stimulate immune system, increase metabolism. As a result, they increase mental and physical performance, provide non-specific regulatory effect on the course of stress reaction of the body, increase overall resistance in relation to various adverse factors of biological, chemical and physical nature, prevent and slow down progression of aging diseases (cardiovascular and oncological diseases, metabolic diseases). Adaptogens’ action is based on mechanisms which activate and support a broad range of protective reactions. It has been found that sustainable adaptation phenomena is based on activation of protein synthesis which leads to formation of resistant structural trace in organs and tissues, strengthening RNA adaptive synthesis, DNA exchange activation, increase of energy metabolism enzymes activity and stimulation of regeneration processes – all together this ensures normal functioning of the body in adverse conditions. The most important result of adaptogens’ action is significant enhancement of cellular and humoral immunity. They stimulate endogenous interferon formation, increase level of interleukins, other cytokines and endorphins in biological fluids, as well as stimulate functions of effector cells (phagocytes, natural killer cells). In case of long-term administration (1-2 months) they improve characteristics of cellular immunity through production of both interferon and immunoglobulins. Adaptogens are agents which prepare systems of the body to influence of various types of loads and damaging agents. Therapeutic effect of adaptogens based on enhancement of long-term adaptation to stresses, acceleration of resistance development against extreme factors and recovery after damages is reached only in case of their long-term administration. An essential point here is that this effect manifested in the form of normalization with deviation from physiological norm regardless its orientation is more significant with deeper (up to a certain limit) prior unfavorable changes in the body. Humisil improves immunity due to its ability to stimulate cellular and humoral protection factors, erythro- and in particular leucopoiesis, provide T-stimulating effect. It activates production of endogenous interferon. Humisil’s immunostimulating effect is achieved through central mechanisms of homeostasis. It slows down hydrolytic processes in thrombocytes and prevents depression of oxidative processes in leukocytes, increases bactericidal properties of blood and skin. Prophylactic administration of Humisil weakens body’s hormonal response to stress exposure, so it can be used for pharmacological stress correction, i.e. “medicine for healthy individuals”. Humisil provides growth of ion points number resulting from increase of cell membranes electrical activity. Ultimately it promotes body’s resistance against influence of external sources of inhomogeneous magnetic fields which distort natural field structure of the human body. Humisil is an excellent tool for cancer prevention, free of cumulative toxic and side effects. As a prophylactic anti-cancer agent, Humisil increases body’s resistance to exposure of carcinogenic factors and prevents development of local pre-cancerous changes. Humisil successfully copes with a task of preventive treatment phase following a recovery phase after radical specific treatment, it also prevents recurrence and metastasis of tumors. Humisil, having low-toxic synthetic and practically non-toxic natural compounds in its content, is a reliable tool for cancer prevention implementing its protective action through a set of nonspecific adaptive or stimulated mechanisms, both for practically healthy patients and those with various diseases, including oncological diseases. Importance of Humisil application in geriatrics should be particularly noted, as cancer diseases are more often to happen in old age which is particularly characterized by increased sensitivity to a variety of adverse effects. Application of Humisil in combined therapy enables a physician to intentionally modify reactivity of the organism by transferring from pathological into an adequate one. Humisil allows long-term use, practically lifelong. 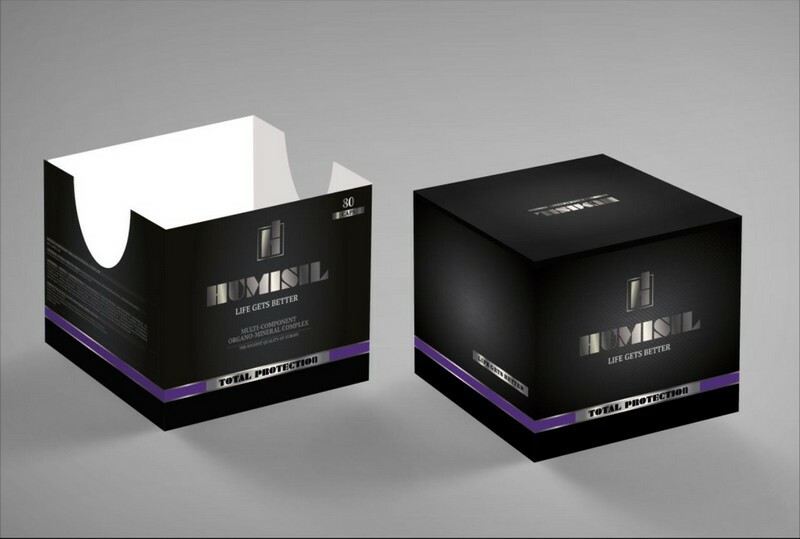 “Humisil “Total protection” — new revolutionary last generation healthcare product based on antihypoxants and actoprotectors with stress-protective activity. “Humisil “Total protection” compensates insufficient oxygen supply into human body, especially at the cellular level, stabilizes cellular respiration in all life-critical systems and organs. The product improves performance under extreme and adverse conditions, mental strain and physical overexertion, chronic fatigue and tiredness, restores ability of attention concentration and handling large and complex data volumes. The product is an effective supplement for therapy of diabetes, neurodegenerative diseases and viral infections (including all forms of hepatitis). It promotes to increase average and maximum age of life. “Humisil “Total protection” promotes recovery and preservation of males and females’ reproductive functions under conditions of mass use of natural and synthetic toxins in food and water. It provides effective protection against toxic chemicals sprayed in the atmosphere (including barium and aluminum), as well as other substances of synthetic and pseudo-biological origin, including components of voluntary-compulsory vaccination agents suppressing nervous and immune systems of human body. Sodium polydihydroxy-thiosulphonate derivatives – substances classified as antihypoxants and antioxidants which reduce oxygen consumption and increase body performance efficiency in extreme situations; provide antihypoxic action by improving efficiency of tissue respiration under hypoxic conditions, especially in organs with high-level metabolism (brain, cardiac muscle, liver), provide reduction in oxygen consumption under significant physical loads, improve aerobic respiration, decrease mental and physical fatigue, promote successful execution of labor-intensive physical operations. Indole derivatives – highly efficient antihypoxants, hepatoprotectors and actoprotectors which provide protection of the body against influence of adverse factors of physical, chemical and biological nature impacting the body. Succinates of cerium, zinc, manganese, magnesium citrate – optimize course character of intracellular reactions, providing a wide range of protective effects under conditions of prolonged oxidative stress. Hymatomelanic substances — natural compounds exhibiting polyvalent biological activity with intermediate properties between fulvic acids and humic acids. vegetative neurosis, asthenic disorders, fatigue, neurodegenerative diseases.